Frances Katherine Provenzano, former Head of Advertising and Design for Cost Plus Imports, artist, mother, grandmother, aunt and friend, passed away at her home in San Francisco on November 2nd, 2018. She was 94. Born to Sicilian immigrants Carmela Musumeci and Carmelo Manuli in Greenwich, Connecticut on March 23, 1924, Fran was the youngest of four siblings: Fillipa, Phillip and Katherine. She became the first in her family to go to college, receiving her Bachelors degree from Syracuse University in Fine Arts and her Masters in Education from Columbia Teachers College. What started off as a small, localized San Francisco company, Cost Plus Imports expanded into the national scene with Fran’s designs at the helm. As the Head of Advertising and Design for Cost Plus for over 20 years, Fran’s bold, witty designs gave Cost Plus the “highly recognizable” style (quoted from the San Francisco Chronicle in 1979) that launched it into the phenomenon it is today. 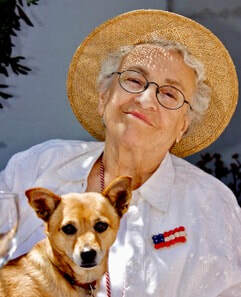 Her designs became synonymous with the company, receiving acclaim for Fran’s ability to elevate simple items such as cocktail napkins and wrapping paper to a fine art. Some of her most popular designs include San Francisco manhole cover rubbings, a laughing Mona Lisa series, a running shoe homage, and Queen Elizabeth at a party. Fran’s sense of humor and fun-loving nature will be fondly remembered by her loved ones. She was a master of practical jokes and pranks, and loved to laugh with others over stories and witty banter. She will also be remembered for her fiery spirit and impassioned opinions. She was a talented artist, who continued her love of painting and sketching well into her nineties, painting vibrant still lifes at her home studio and with her art group. She was an avid reader, who could always provide a good book recommendation, and one could often find her reading in her sitting room, with her dog Godiva by her side. Fran is survived by her daughters Katherine Provenzano (Joshua Hoover) and Carol Provenzano Kelly (Kenneth Munson), grandchildren Sophia, Stuart and Joseph, many nieces and nephews including: Martha, Nicki, Kathie, Carmela, Tommy, Phillip, John, .. And cherished friends and beloved dog Godiva. ​ In lieu of flowers, please make a donation to La Casa de las Madres 1663 Mission Street Suite 225 San Francisco 94103, an organization dear to Fran’s heart.